Hot/Cold. Love/Hate. That’s probably the best way to sum up Capri. It’s true what many people told us before we went, you’ll either fall in love or you won’t. Lucky for us we fell in love, but not the love at first sight kinda love. Stepping foot off of the ferry into a vastly overcrowded marina, wasn’t the picture I had painted in my head of this Jackie O inspired sprawl of a glam-filled island. Once you’ve visited this enchanting island it won’t take you long to realise that there’s two Capris. The one full of boatloads of tourists ferried across from Naples to the tiny island where selfie sticks are a plenty and tat souvenir shops are overflowing. Then you have the quiet spots, the places where lemon groves stretch down the cliffs, the tranquil places that you can escape to with stunning views of the island, the untouched alleyways of Anacapri where the culture still sits as you’d always imagine a small Italian village to be. Like any good love story, you have to dig a little deeper, give it time and appreciate the best qualities. So lend your pretty little ear this way as I share some of my best tips to make this island you’re next love affair. WHERE TO STAY: As a rule of thumb, if you’re looking for somewhere that’s a little more than a place to just lay you head for the night, you’ll want to up your budget. Capri is beautiful, but she doesn’t shine her brightest until the ferry boats head home. This is why I’d say it’s important to find somewhere that’s relaxing, with a pool, to hang during the day. It might mean splurging a bit but it will make your stay on the island much more enjoyable. Villa Marina – If you love luxury and get a twinkle in your eye when they call you by name, this is your place. Is the perfect hotel to kick up your feet and it’s equipped with a beautifully calming spa should you be in the mood for a treatment or two. It also packs a tasty breakfast buffet and a stunning pool. Cesar Augustus – You’ll pay a mighty price but this place is pure luxury. Think private transfer from the Marina to anywhere else on the island and views like nowhere else. It’s perched on the edge of a cliff in Anacapri and the sunsets + sunrises are like no other from this spot, or from the infinity pool that faces the sea. You’ll be sleeping where princes, kings and A-listers like to lay their heads. WHERE TO EAT: Family owned and operated restaurants frequent Italy and this island has nothing short of them. Aside from the food, the style is something that’s second to none in the evening. You’ll soon see that it’s less about slipping on a sundress and more about dressing for the runway. It’s a uniquely known rule for those frequenting the island and heading to dine, that you can never be overdressed. Al Piccolo Bar – The perfect spot on Capri’s Piazzetta to park yourself and people watch. It’s a great place to sip a coffee in the morning and gaze upon the early hustle and bustle of the town opening for the day, and the best spot to park yourself to watch Capri’s nightlife. The four bars surrounding this popular square are usually opened until about 2am and any of them make for a great seat to watch the “fashion show”. So take your pick, select your drink of choice, and relax. La Capannina – Just off of the Piazzetta, this restaurant offers a great value-for-money option with reasonable menu prices and delicious cuisines. You’ll be treated like an added guest at a family dinner party. Dine with the De Angelis family while enjoying some of the original fares of the island. Oh, and you never know who you might be dining with, this quaint little place has hosted Anne Hathaway among other celebs. Ristorante Il Geranio – Make a reservation to dine candlelight with breathtaking views of Faraglioni. This place is where contemporary luxury meets traditional Mediterranean cuisines for a memorable dining experience. JK Place – A great place to grab a drink and feel like a million bucks. (Also a great place to stay if budget isn’t a question). So if you’re looking for a place to sip an aperitif with swoon-worthy views, this is your spot. 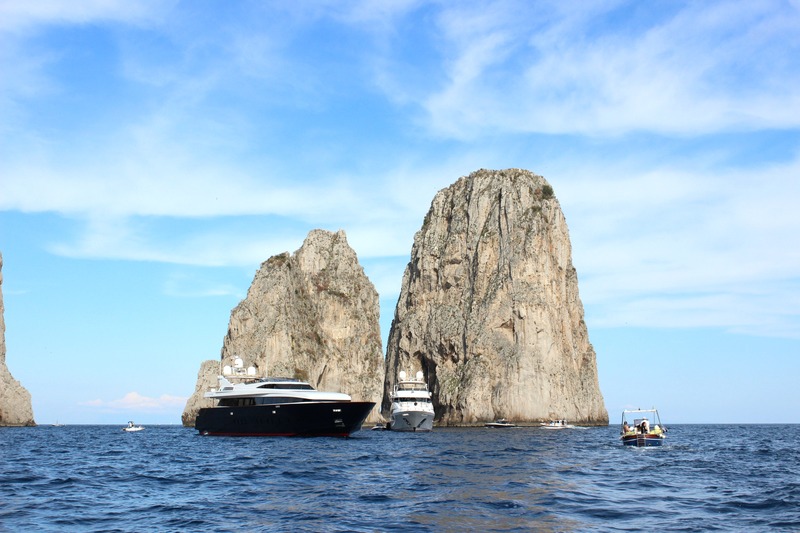 Capri relax boats – The hands down best way to see the island is from the water. If there’s nothing else you do or takeaway from these tips, book a private boat tour. From the Blue Grotto, Punta Carena and Faraglioni to all of the other little nooks and crannies, this island is especially magical from the sea. Insider tip: Try to get Gino as your tour guide, he’s surupy sweet, incredibly knowledgeable and an authentic native of the island. For an added touch, pack a picnic and a bottle of vino – it has the ingredients for a romantic afternoon written all over it. 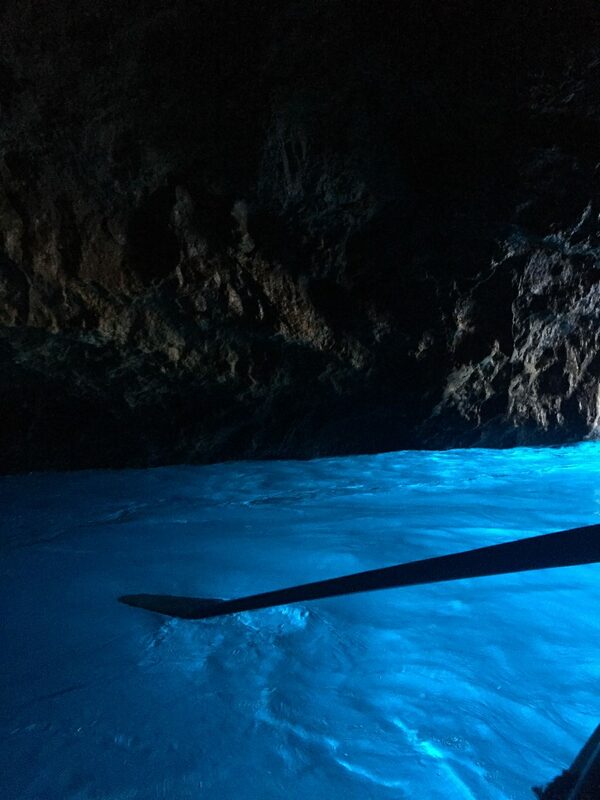 The Blue Grotto – I’ve heard mixed opinions on this one, that it’s a great experience or that it’s a big tourist trap with long queues. Personally, we loved it! If you choose a private boat tour company they will usually know the best times of day to go in order to miss the long lines of people. We only had to wait about 5 minutes for a canoe to come and pick us up off of our boat and take us in. Unfortunately, you have to pay extra to go in and it only last a few minutes but I still think it was worth it, even if just to tick it off of your list. 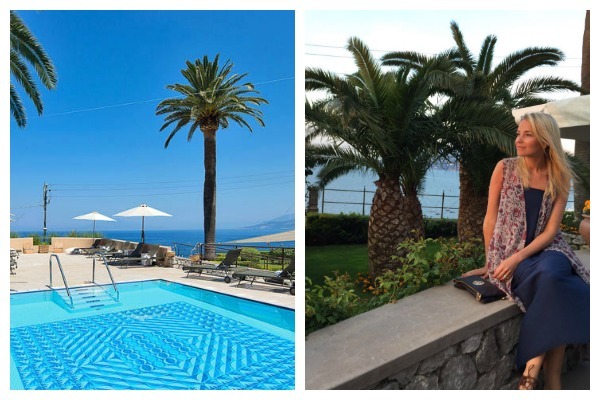 We viewed it as a unique experience that we might not ever do again, so I’d say add it to your “must do” in Capri. 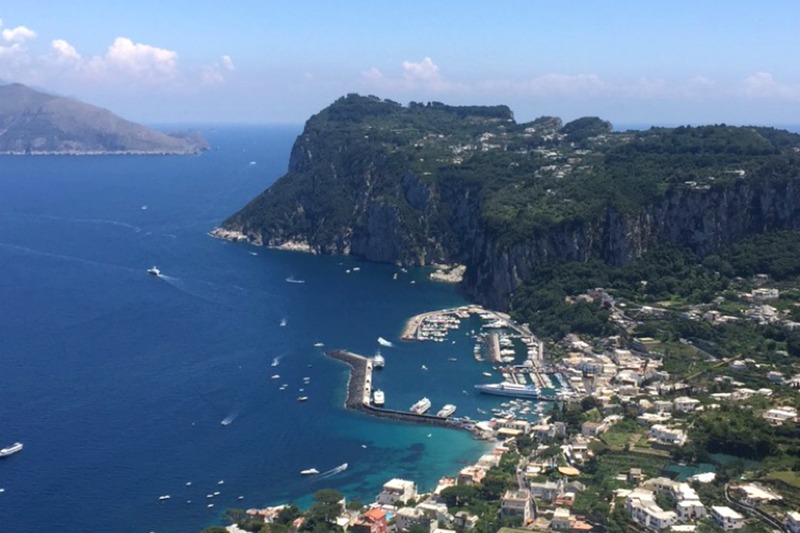 Phoenician Steps – Why not throw on your yoga pants, grab a bottle of water, and walk the 921 steps that connect Capri to Anacapri. This is a fairly easy walk that takes about 30 minutes from the bottom of the hill in Capri. When you reach the top you’ll be greeted with roads lined with quaint cafes, shops selling Italian handcrafted pottery, and some of the best gelato. The views from the top are worth every single stride. If you just aren’t feeling like a dose of exercise, opt for a taxi to take you to the top and enjoy the walk down – a much easier way to still admire the island of Capri in all its glory. Since moving to England it’s certain that I’ve caught a travel bug. One that has bitten hard and if budgets could be thrown out of the window, I’d be finding myself jet-setting more often then not.